Motorcyclists have an image to maintain. We march to the beat of our own drummers. Mine is the hellspawn of Dave Grohl, Neil Peart, Aric Improta, Steve “the Mad Drummer” Moore and the duo known as Justice… with Les Claypool on bass. Whatever we ride, we express our identities to the world via our riding gear. Imagine a sport bike rider. Now imagine a cruiser rider. An ADV rider. A sport tourer. Now imagine a guy or gal that rides a ‘82 CB750 and is on his way to that trendy bar for a PBR and to see a band he likes before they become cool. What does he wear? TCX knows. Take a look at the X-Grooves. The TCX X-Groove Waterproof shoes, that also come with a Gore-Tex version will go well with the skinny jeans and the ironically-worn Members Only jacket, because style doesn't stop when it rains, and waterproof footwear is clutch. But they also work well for the casual rider running some errands around town, at work places with a bit more lenient dress code, or worn at a destination where you’re just kickin’ it, like PBR guy above. The X-Grooves look good, but they also offer the protection one would expect to find in a riding shoe with the malleolus, toe, and heel reinforcements. Constructed of full grain leather and suede, the X-Grooves are available with TCX’s proprietary waterproof membrane or the highly venerated--and for good reason--TCX X-Groove Gore-Tex shoes which utilize the GORE-TEX waterproof, breathable membrane. 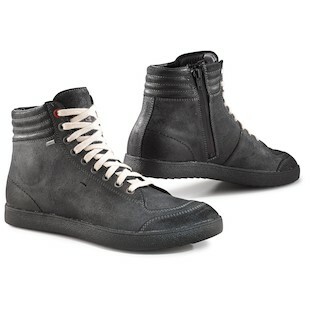 The WP version is available in a glossy Black and sueded Urban Grey while the GORE-TEX version comes in sueded Black. Knowing that skinny-jeaned legs are accompanied by skinny feet, as with some of its other new releases, TCX has equipped the X-Grooves with narrower fit. And to add an exclamation point to the package, there’s a side-entry zipper which makes donning and doffing the X-Grooves a cinch. So, ditch your Chuck Taylors for something similarly styled but with the protection you need, Mr. PBR. We don’t want you limping into the bar to tell us how you liked that band before they were cool.